Tom developed his passionate obsession for forging and shaping metal when he was 13 years old, in Lucien, Mississippi. Following the directions in a book, he began by making knives from old sawblades, then advanced to Damascus steel. Staying in the world of metals, he worked as a machinist, tool & die maker in his 20's. 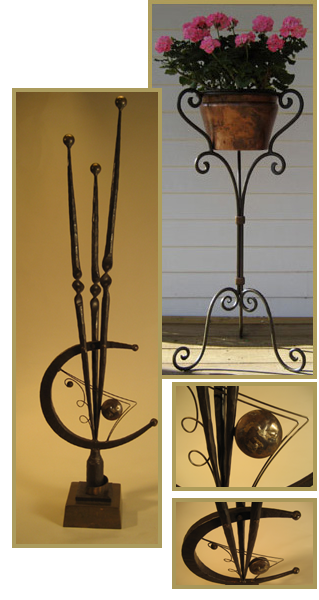 In 1980, he decided to pursue his artistic bent and make blacksmithing his full-time profession. 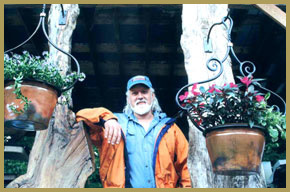 Specializing in functional and decorative iron work, Tom participated in juried craft shows in Baton Rouge, became a multi-time award winning artist, and demonstrated at the 1984 World's Fair in New Orleans. In the summer of 1990, seeking solace from the southern heat, Tom travelled north to the cool, lush Blue Ridge Mountains of North Carolina. He settled in Boone, where he began designing and prototyping for the furniture industry. His fine forged designs have garnered national recognition, on-going royalties and prestigious awards. Chosen by Handmade In America, based in Asheville, to represent North Carolina Blacksmiths in 1997, his sculpture "Mozart's Magical Moment" went on tour and exhibited in National Galleries. Tom and his wife Bonnie (a Graphic Illustrator) reside near the historic town of Todd. His hand-built studio, Fiddler Forge sits nestled on a lush bank at the headwaters of Three Top Creek, which feeds into the ancient and protected New River. With the canopy of shade trees and the cool rushing stream combined, his shop never exceeds 76 degrees, even on a hot July day. Now a full-time artist, Tom actively exhibits his work at Juried Arts, Crafts and Garden Shows, and in regional Art Galleries. Click on underlined show for more info about the event.